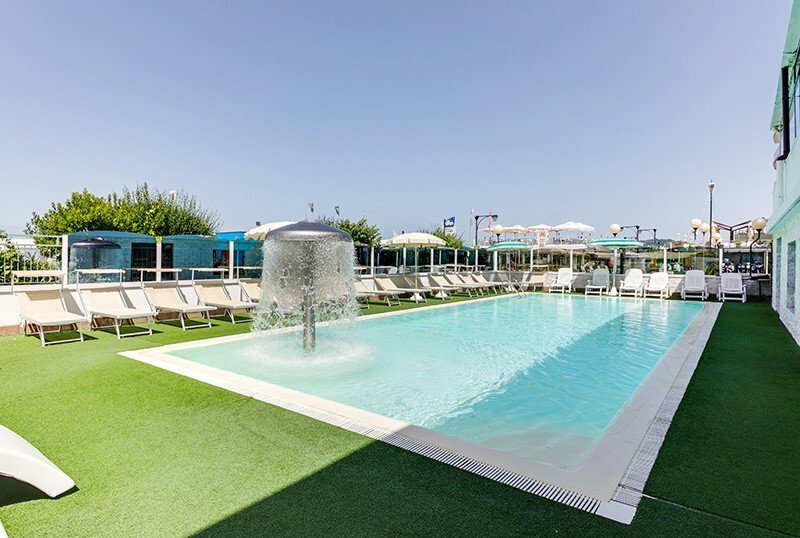 The 3-star Hotel Garden in Cattolica is a family hotel on the beach with numerous facilities for children, a swimming pool, a garden with games, parking, a restaurant with gluten-free cuisine. Admits pets of all sizes. The hotel is located in Cattolica directly on the sea, with direct access to the beach with no roads to cross. The property is located approximately halfway between the Aquarium and the center of Cattolica, both within walking distance in less than ten minutes. The rooms, completely renovated, have a balcony, large bathrooms with shower and hairdryer, minibar, TV, WI-FI, air conditioning, safe and telephone. Swimming pool, garden with trees and games, terrace overlooking the sea where you can have breakfast, open-air porch, free bicycles, 2 sea view restaurant, elevator. Organize welcome drinks, aperitifs every day, tea corner for goodnight and theme nights. Beach towel available with deposit and paid laundry. PARKING: free and uncovered, 800 from the hotel; 12 parking spaces in the hotel for a fee. CONVENTIONS: beach, organized excursions with entertainment, beach for dogs on reservation with supplement. BREAKFAST: buffet with sweet and savory products, to be enjoyed also on the terrace overlooking the sea. LUNCH AND DINNER: meals are presented front cooking buffet in the sea view restaurant. Pizza for lunch and dinner. Drinks are included with meals. OTHER: theme nights (Romagna evening, ring-shaped cake, midnight spaghetti) are organized. In the hotel: large garden with inflatable games and sports arena, indoor playground area with play station, strollers, entertainment every day from morning to evening and baby / mini / junior club. Upon request and payment: baby sitter and pediatrician service. At meals: kitchenette for parents, high chairs, baby menu for lunch and dinner, homogenized, baby food, afternoon snack. On the beach: swimming pool, playground area and entertainment service. 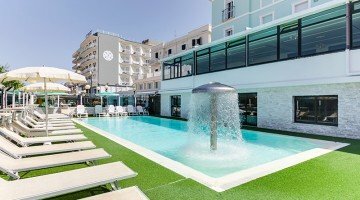 The pool is located in the garden, has a rectangular shape, 90 square meters wide, 150 cm deep and is surrounded by a sunbathing area with sunbeds and beach umbrella. Animation moments are held for adults and children. The hotel is located right on the beach, so the affiliated bath, n. 86-87-88, can be reached safely without roads to cross. Here guests have at their disposal: swimming pool, gym, playground and entertainment. Our packages designed for Easter and April 25th! All Inclusive Formula, prices per person per day starting from € 28.00.